April Kennedy...My Life + My Style: Kaia's Got A Brand New Room. Kaia's Got A Brand New Room. Blue + Gray bedding is Dwell from Target. White duvet is from Ikea. It is all white and has a pretty windowpane pattern on it. as well as the throw pillow. and is usually out of stock the day it becomes available. I got lucky two times at the store. This one was on my couch before being moved into her bedroom. and saw ONE sitting on the shelf. The walls in Kaia's room are painted Silver Sage by Restoration Hardware. But mixed to match by our local paint store to save money. The bulletin tutorial is here. And, the fabric I used is Joel Dewberry's Nap Sack in Sunglow. Heck everything in Forever 21 is affordable! Her desk and chair were purchased from PB Kids quite a few years ago. They are showing extreme wear but still work. Kaia's nightstand is one of my favorite areas of the room. We live in a small space. 1300 square feet total. and new it would make a perfect small space night stand! The little circles lamp is from Target. It was on clearance for $4.98. Hooray! The 'Did You Think to Pray' print is from Persimmon + Pink. It is the 8x10 print with a simple matted frame from Target. The little gray picture frame is from Pottery Barn Kids. And the 'K' is from Urban Outfitters. Both were pink from her old bedroom. 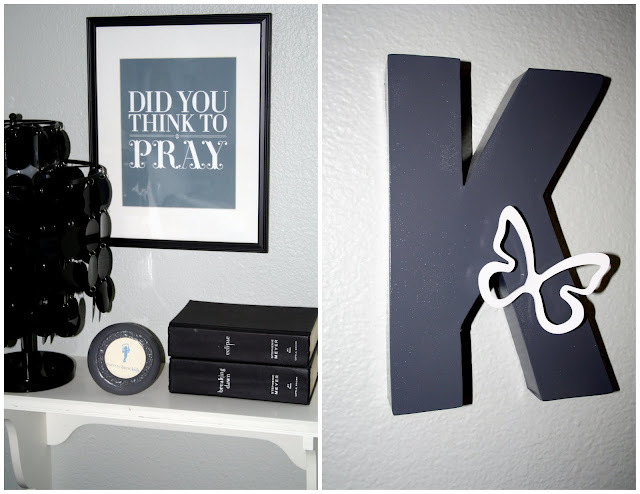 I simply spray-painted them gray to work in her new room. Magnetic butterfly is from Target. And, no teenagers room would be complete without Twilight somewhere. I prefer books over posters! Kaia's dresser is old and is pretty beat up. It was purchased years ago from Bombay Kids. But it still works so we are keeping it. that we were not using anymore. had a piece of glass installed in it. so all her hair and make-up supplies are kept on her dresser. It could be staged prettier...but this is real life. Her blow dryer and straightener are hidden behind the frame. But I do that every morning...not just for picture day. And that completes Kaia's bedroom tour. There are still a few little things that need to be done. Like baseboard and trim installed in the whole room! But that comes with being a contractor's wife. for the last empty corner in her room. Wish it came in a velvet mustard yellow though. I really do love this new rug. We have a no shoes in bedroom rule now since purchasing it. Now if I can just keep our little dog Zoe from peeing on it. Wow! It looks amazing and so serene! Great job! oh, it's so pretty! classy and calm. i love it. It's THE perfect room for a girl her age. I love it. I love the yellow...the lamp...the K....you did a wonderful job. I cannot WAIT until we have space and money to decorate a room for each kid. Just have to get through daycare bills....breathe in, breathe out. I love it! the did you think to pray poster is awesome too. How cute! I would have loved to have a room like that as a teenager, heck I'd love to have that room now! Would you PLEASE adopt me? I love this room - it is beautifully girly and perfect in every way. Love the fancy pillows! So cute, April! Maybe home decor should be your next career. Think of all the busy moms you know that could hire you to re-do their kid's rooms. I love it!! you're so good at this stuff. putting it all together & making it look fantastic. You must do a lot of window shopping to find so many great things in so many different places. How funny is this? I have the same rug and the same flower pillow from target in my master bedroom. So funny. We have similar tastes!